Does P2P lending respond to geopolitical stress like stocks do? It has been said that the stock market loves good news and can even handle bad news. It’s uncertainty that makes people panic. 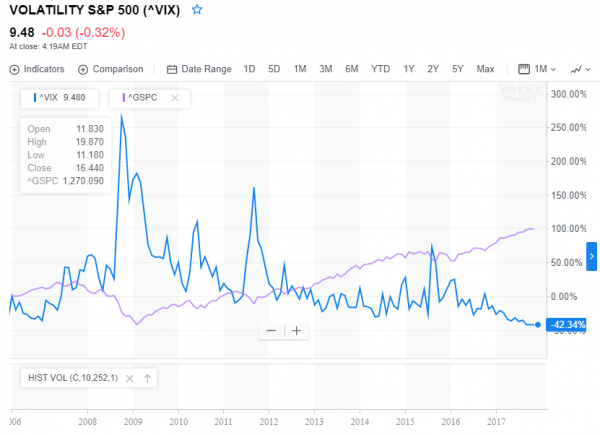 Most investors take their reading of the stock markets’ blood pressure using the CBOE Volatility Index, or “Fear Index.” The figure represents the broad sentiment of equity investors. When the number is high investors are nervous and uncertain about the stock market and its future. When the value is low, investors are complacent and without much fear. If you look at this chart above overlapped with the performance of the market there is a clear correlation. When the market is fearful stocks drop and vice versa. Occasionally these fears are rooted in economic indicators like unemployment rates and interest rate movements. However, sometimes more complex factors can drive pricing shifts. The most recent example has occurred in the U.S. market were renewed concerns about North Korea’s provocative actions have roiled the market. Yet, for the diversified investor with holdings in marketplace lending, do these same rules apply? Data from the Orchard Index offers clues. The data “tracks the aggregate performance of loans to consumers originated and funded on eligible US-based online lending platforms,” but is also a good general read on the state of P2P lending globally. While marketplace lending is relatively new, the data from Orchard presents a reassuring picture that helps answer the question of sensitivity to geopolitical stress. Across a one-year, two-year, and three-year horizon the performance of the Orchard US Consumer Online Lending Index (image above) has been consistently strong with little interruption despite major upheavals like Brexit, and a contentious U.S. presidential election. This upward movement despite geopolitical uncertainty makes intuitive sense: the movements in stocks are largely influenced by indirect factors. As the economy becomes increasingly global more people are learning that what happens in China happens in the U.S. and what happens in the U.S. happens in Europe. Orchard summarizes this finding best by explaining “while public markets owe their volatility to numerous factors, consumer loan performance is very much a function of the financial health of the American household.” Stocks and P2P investments have separate influencers. P2P lending is not free from influence. However, the important takeaway is that the influencers are different than those driving stocks. The result: investors holding marketplace loans have a deeper diversification in comparison to holding a collection of all equities.